Over the years we increased our egg production as our children finished high school and started working on the farm. They have decided that egg farming is not for them and are pursuing other dreams. My wife and I will continue to farm and produce organic pasture raised eggs, but on a smaller scale that we can handle just ourselves. We will continue to supply eggs to a number of the stores that are closest to our farm. 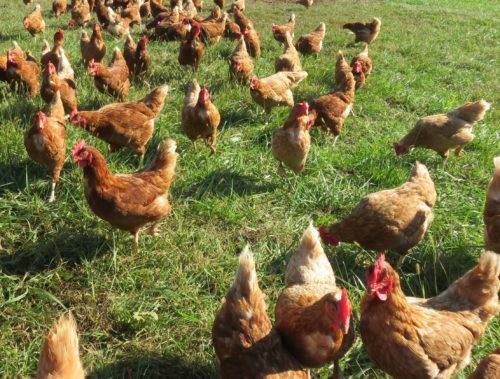 We are your local source for fresh organic pasture-raised brown eggs in the Baltimore and Washington, D.C. metropolitan areas. In addition to pasture, the poultry are fed organic feed. We do not use antibiotics, hormones, vaccines, synthetic vitamins, etc. As stewards of the earth, we see our responsibility to carefully utilize the resources of the soil, using sustainable, organic methods to produce the most healthy eggs and at the same time improve the soil for future generations. We are what we eat. When we eat meats and eggs that are raised in dirty, smelly confinement situations, fed chemically produced, genetically modified grain, and the poultry and animals are routinely given antibiotics and other meds to keep them “healthy”, is it any wonder that most Americans also require medication to keep them “healthy”? We view our role in providing nutrient dense, healthy pasture raised eggs as an important part of your health care, just as important as the service of your doctor in caring for your needs when you are sick. Our goal is to provide food to help you stay as strong and healthy as you can.